Home / baseball / Buffalo / Buffalo Bisons / CM / MiLB / schedule / Sports / This weekend's Bisons lineup includes a Honda fridaynightbash!, Dino Night, and Autograph Day! This weekend's Bisons lineup includes a Honda fridaynightbash!, Dino Night, and Autograph Day! BUFFALO, N.Y. -- Heads up Bisons fans…there are only three weekends left this summer at Coca-Cola Field! As crazy as that sounds, the calendar unfortunately doesn't lie. There are only three more weekends left for you to join your family and friends at the ballpark and enjoy the excitement and value of Bisons Baseball. HOWEVER, we do have some great news. The weather continues to be tremendous and the Herd is home THIS WEEKEND for a series of great games against the Durham Bulls. There's a Honda fridaynightbash! 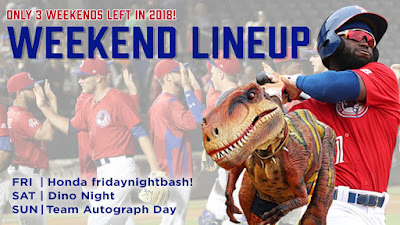 with fireworks, Dino Night with larger-than-life dinos from Ravage Productions on Saturday and the fan-favorite Team Photo & Autograph Day on Sunday… And that's just the headlines… check out all that's on tap at the ballpark this weekend and GET YOUR TICKETS today. It's 'Tribute to Grease' Night as we celebrate 40 years since the release of this iconic film. Get the party started early with the Resurgence Brewing Happy Hour featuring $3 craft beer and food specials. There will also be $5 grab bag specials at the merchandise kiosk and of course post game FIREWORKS to light up the sky. Back by popular demand, the Bisons annual Dino Night returns, presented by Fidelis Care. Your kids' faces will light up when they meet Teddy the T-Rex and Vinny the Velociraptor and they will no doubt enjoy interactive activities from the Buffalo Museum of Science. Parents, we got something for you, too! It's Labatturday Night with $3 Labatt Blue and Blue Light specials in the Centerfield Pavilion starting at 4 p.m. Not to mention pulled pork sandwiches for only $4 and the chance to win 'Beer for a Year' during the Bisons game against the Bulls. It's time to meet the Herd with the team's annual Team Autograph Day. Fans will be allowed onto the field as soon as gates open at noon with the entire team available for autographs from 12:05-12:25 p.m. The first 1,000 fans will also receive a free 2108 Team Photo, compliments of Tops Friendly Markets, so you can get all those signatures in one place. As a Kids Club Sunday, the game also includes postgame Kids Run the Bases. TICKETS: Sunday Team Autograph Day. (Please note baseball bats will not be allowed into the ballpark, in accordance with our ballpark carry-in policies. CLICK HERE for more info).